Here is the way to advance the speed possibility of your browser slides. You just have to download SafariSwiper on your jailbroken device using Cydia as it is a Cydia tweak of iOS 8.4. So if you are still using a device without jailbreak, just get Taig and you will have a list of Cydia tweaks to feel you better using your device. As this is a free tweak you can get this without any cost. And also to install you don’t need to follow any method. Therefore as it is a simple, useful and free of charge Cydia tweak, has become a well reputed one for all iOS users. By the way if your device is not a jailbroken, jailbreak it before you install this on your device as you cannot get this without Cydia. For Windows and Mac users are having Taig and PP tools too. If you are going to use Taig, Windows users have to download 2.4.3 and Mac users 1.1.0. After you jailbreak the device tap and launch downloaded Cydia from your home screen. And the thing you must know is this can only use on iOS 8.4 – iOS 8.1.3 devices. So if you are using iOS 8.4.1, still there is no any tool to jailbreak it. And refer following list to get to know the compatible devices. As the first step, initiate Safari on your device as usually you do. Then open few tabs on it. And then simply start exchanging tabs you opened with the previous step. And use the navigation bar at the bottom. 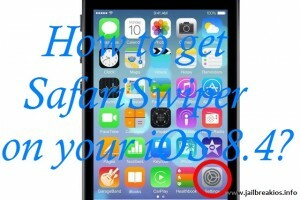 Now your device has been installed SafariSwiper within former few steps. You don’t need to follow any other step. So when you using Safari again you are able to use SafariSwifer too. Anyhow we invite you to have more and more Cydia tweaks and make the device advance than it is.